Available from stock, National Fire Equipment’s new seismic clamps and braces are now supplied with electro-galvanized finish! 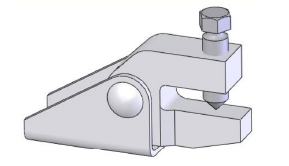 The figure 030 structural clamp attachment or sway brace end (as shown below) uses 1” – 2” SCH 40 pipe and all in one fitting. Also new is the figure 020 rod swivel attachment (pictured below) that may be used in a pitched or sloped roof application, to meet requirements of NFPA 13, or may be used as an upper attachment with short hanger rod to omit seismic bracing. Click here to view our complete line of PHD seismic products and technical data sheets. 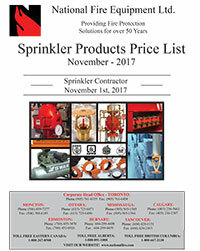 Please be advised that National Fire Equipment Ltd. will be implementing a price increase of 5% to 13% (depending on sprinkler or standpipe product category) April 2nd, 2018. Manufacturer increases in addition to the recently declining Canadian dollar has made it difficult for us to absorb these changes. New price book publications should be available for download from our website prior to April 2nd, 2018. 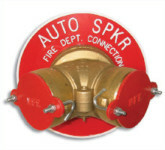 National Fire now has available our new economical model A95 siamese connections. Identical to our standard surface mount models, our new fitting will save you money! Call the NFE branch nearest you for special net pricing on these new siamese connections as well as the designation plates and knock-off caps! New vinyl extinguisher covers have just arrived in all NFE branch locations. Available in English and French, these red covers are very durable and attractive and are supplied with or without windows.